Aiden Felty, a Junior here at Innovation Academy, had a tremendous outdoor Track and Field season. He improved his personal bests from 51’1.25" in the shot put and 129’6" in the discus, to 61’7" and 162’4" respectively. In the shot put, Aiden was undefeated all season, until the New England Championships, winning the Sunset Invitational, MSTCA Coaches Invitational, Eastern MA Div. 4 championships, and the MIAA All-State meet. Aiden went on to place 2nd at the New England Championships in this event. After the New England Championships Aiden continued to nationals where he placed 9th and had the second best throw for a junior (11th grader) at the meet. 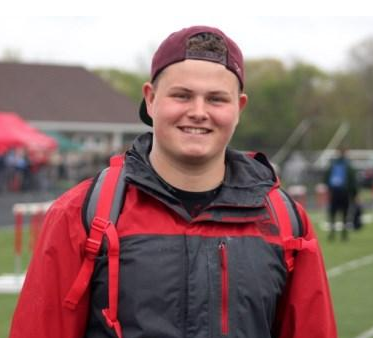 His top mark of 61’7" (thrown at the divisional meet) was a school record as well as the top throw in New England this year, the furthest throw in MA since 2009, and an MA junior class record. In the Discus, Aiden was also undefeated in the regular season. He won the Sunset Invitational and the Eastern MA Div. 4 championships. He also went on to place 4th at both the All-State meet and New England championships. Aiden is also a two time Boston Globe All-Star.